Locality: United States, Colorado, Boulder, Colorado Tallgrass Prairie Natural Area: Parcel 7. South of Boulder, at the beginning of Highway 93. Habitat: Xeric tallgrass community; moderately steep terraces, soil very cobbly and sandy. 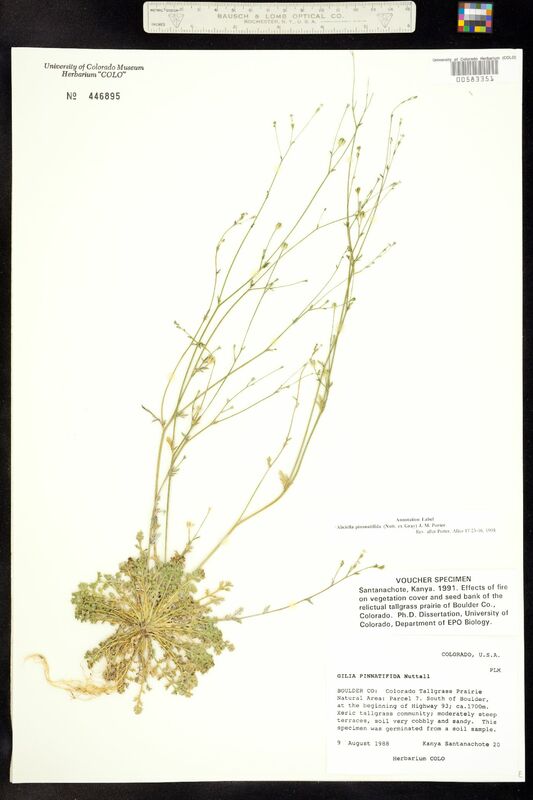 This specimen was germinated from a soil sample. Notes: Aliciella pinnatifida (Nutt. ex Gray) J.M. Porter, Rev. after Porter, Aliso 17:23-46. 1998. Voucher specimen. Santanachote, Kanya. 1991. Effects of fire on vegetation cover and seed bank of the relictual tallgrass prairie of Boulder Co., Colorado. Ph.D dissertation, University of Colorado, EPOB. Original ID: Gilia pinnatifida Nuttall.